Nothing says Christmas quite like a pretty tree filled with lights and sparkly baubles and topped with a glittering star. Right? 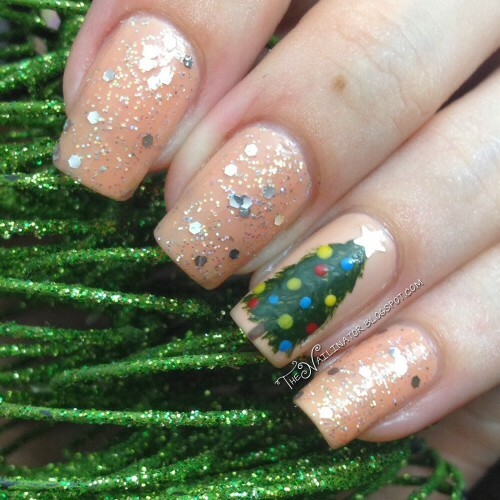 I wanted to do some Christmas tree nail art this year, but I didn’t really want to have a tree on every nail so I decided to go with an accent nail instead. I started with two coats of NYC Fashion Safari on all my nails and then applied Klean Colors Military Green with a small brush and small strokes to make the tree for the accent. I decked it out with a dotting tool and a glitter star for the topper. For the rest of the nails, I added one coat of Bobbie Star Gazer over the base. Star Gazer was so pretty in the bottle, but I have to admit I was disappointed when I tried it. By itself, it was so faintly pigmented that I’m positive I would have had VNL even after 3 or more coats. The glitter may have been dense enough to cover everything up, but choosing NYC Fashion Safari as my base gave me the color I was looking for and everything ended up alright. Being a VNL-aphobe means I don’t play with jellies very much, but I will have to experiment more to make use of the pretty jellies I do have. Anyway, this isn’t my best work and I don’t LOVE it like I did my snowflake nails. I’m not a huge fan of nudes on my nails so, honestly, it doesn’t really stand a chance. That being said, it IS cute and I still learned something important: Elmer’s School Glue Gel (the blue stuff) works as a fantastic peel-off base for glitter polish. I squeezed some into an clean polish bottle, applied one thick coat, and let it dry well before applying my polish. I only sported this look for a day before taking it off, so I’m not sure about the wear time. That’s it for me today. It’s been a long week for me. I hope you are having a great one. Do you use anything as a peel off base for glitter polish? What polish/es have you used recently that looked the bomb in the bottle but bombed when swatched? Before I show you my nails today I’d like to take a moment to remind you that I’ve got a lovely GIVEAWAY going on right now. If you haven’t joined already I hope you will do so and tell your friends about it. I’ve got 3 great prizes up for grabs and it is open internationally. I’ve got a very simple swatch and review for you today. 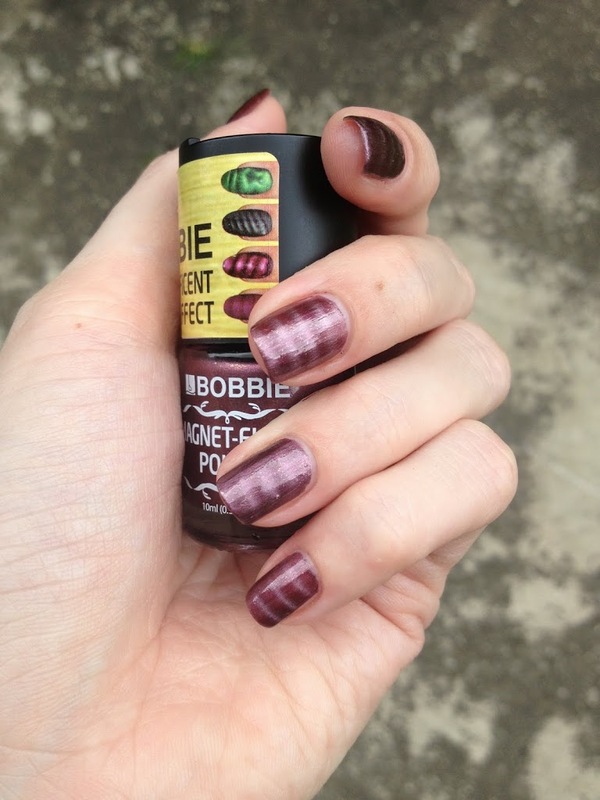 I’ve swatched Bobbie Purple Dazzle over Klik Purple Velvet to get this pretty look. (Klik Purple Velvet is a frosty purple that is a bit darker than Purple Dazzle.) Purple Dazzle is labeled as a “glaze” and I would describe it as a jelly like frosty purple base with holographic gold glitter floating around in it. It’s quite pretty. 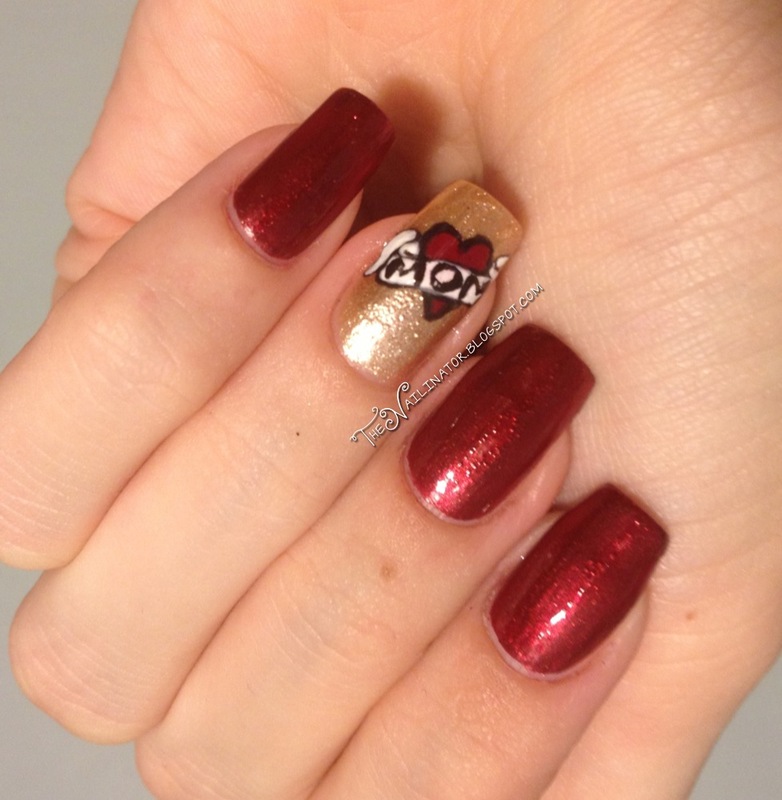 I just wish that they had either made the base without the shimmer or used smaller glitter. If you look carefully you can see that some of the glitter is the size of standard craft glitter and, because it is suspended in a frosty base, the glitter from the first coat appears bumpy under the second coat. It doesn’t look even in one coat so a second coat IS needed. I do like it but I’m not sure I would buy another bottle of this shade. Do you have it? Do you love it? Hate it? Or stand somewhere in between like me? Bobbie polishes are available at many department stores and beauty supply stores for 36 Philippine Pesos ($0.83) for an 8ml bottle. I know it’s been a bit quiet around here this week and I’m sorry about that. I haven’t been able to do much with my nails this past week as I’ve been having a lot of vertigo due to the earthquake that hit last week and all the subsequent aftershocks. The 7.2 magnitude earthquake’s epicenter was in Bohol which is the island next door to us so we felt a big quake too and all the aftershocks are quite unnerving. Having vertigo is really annoying but I’m still thanking God and counting my blessings because it is nothing compared to those who are really suffering from the damage of the quake in Bohol. If you would like to donate funds to help those affected by the earthquake then please visit http://www.redcross.org.ph/. Happy Mother’s Day! My first DIY nail decals. One day a year is not enough to honor the wonderful women who raised us but I do like to take the opportunity to tell my mom I love her and thank her for all the love she has showered on my siblings and I over the years. Love ya Mom! Becoming a mom myself has been the BEST adventure ever and I love LOVE my babies! I decided I needed a Mother’s Day themed mani for today and this is the first thing that popped into mind. 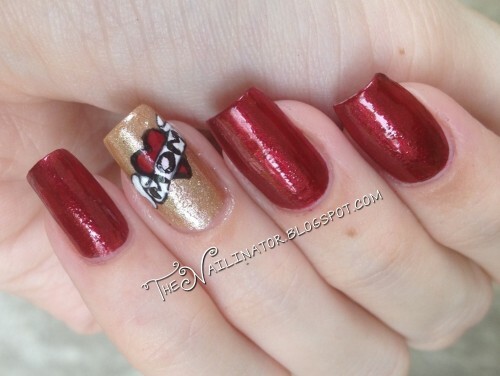 I’m never going to get a tattoo because that’s just not me but I’m ok with nail tattoos. I have wanted to try making nail decals and thought this would be a good time to give it a go. For the decals I used Chic Tea Rose (red), Regular White, and Black Velvet. In the first picture I used Chic Purple Lustre (frosty red) on all my nails except the accent nail but it was raining when I did my nails and the polish bubbled up so badly I ended up taking it off and using Bobbie Chestnut on all my nails. I think it’s cute. What do you think? 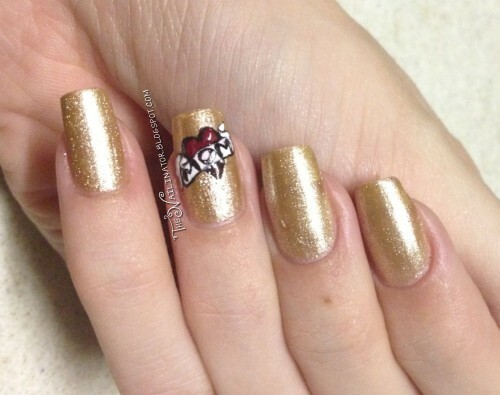 Have you ever made your own nail decals? I started feeling better this evening and my husband encouraged me to go ahead and do what I had in mind for my “Inspired by a Song” challenge for today. So I did! One song we like to listen to is Owl City’s Fireflies so I wanted to go with that. I couldn’t think how else to really go about doing fireflies so I went with swirls of them in a night sky. I chose to use two coats of Bobbie Super Nova. (swatch photo included) Then I took my dotting tool and some lemon yellow acrylic paint and dotted away. So today I tried out my first magnetic polish. This one is by Bobbie and its super pretty! I would absolutely wear this one by itself. 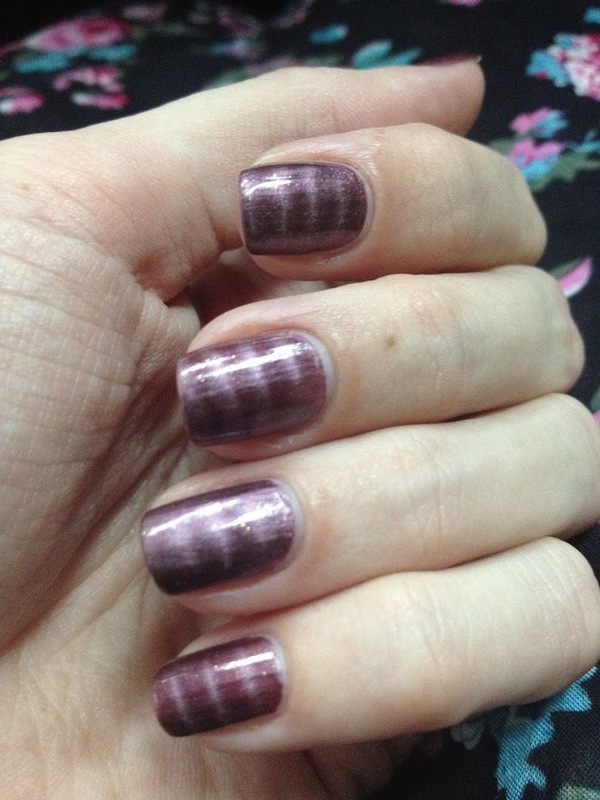 This is a plum color and if you look closely at the photos, you will notice there is a gold shimmer in the polish. I tried getting the effect on my pinky nail a couple if times then finally figured out that I needed to start applying the polish from the side of the nail instead of the middle of the nail like I usually do. Then, working quickly, I hovered the magnet over the side I started with and moved it across the nail towards the more recently applied polish. One second can make a difference. If you are having trouble with magnetic polishes I suggest you give this a try. Be quick and methodical.